A recent acquisition from Nina Musinsky Rare Books in New York is a copy of Leonardus de Utino’s Sermones de Sanctis, printed, probably rubricated and certainly bound at the Monastery of SS. Ulrich and Afra in Augsburg in 1474. 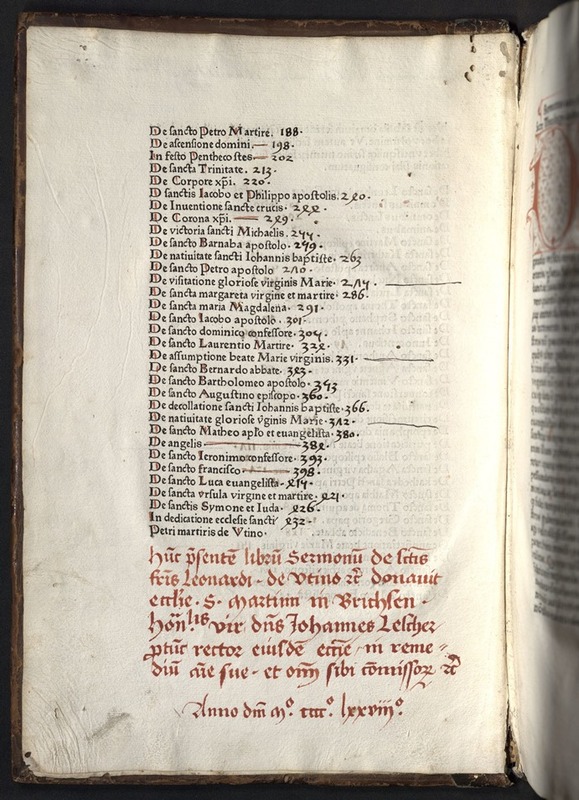 An inscription records it as a gift by Johannes Lescher, Rector of St. Martin’s church in Brixen to his church in 1478. A later inscription records the bequest of the book by Adam Schreindl in 1591 to the Jesuit College in Munich and from there it passed to the Royal Library in Munich where it was later sold as a duplicate. More recently it was in the New York collections of George Abrams (1919-2001) and Helmut N. Friedlaender (1913-2008). This is the third dated book from the short-lived press of the Benedictine monastery of SS. Ulrich and Afra in Augsburg which was an important center of manuscript production in the early 15th century. In 1472 its abbot Melchior von Stainhaim embarked on an ambitious project to establish a monastic press intended for the use of the monks. Surviving documents show the abbot spent considerable time and money setting up a well-equipped workshop with five presses and a variety of types. This and other copies of books printed there suggest that there was also a rubrication shop and a bindery. This post was contributed by William P. Stoneman, Curator of Early Books and Manuscripts.